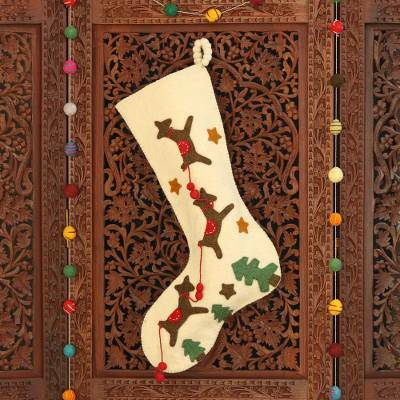 Modern Wool Applique Reindeer Christmas Stocking, "Reindeer Sleigh"
By Rajesh Gehlot, this Christmas stocking is cheerful and modern. He works in wool felt to depict reindeer that fly through a pine forest. Applique motifs in green and brown come to life on the ivory background.